Nicotiana is a tropical genus that has Tobacco as its most infamous member, but all of the 70-odd species are fragrant in flower or leaf, or both. Their pale, luminous flowers, often open in the evening, have attracted a lot of attention from hybridizers who have interbred species until it's hard to know what you've got. 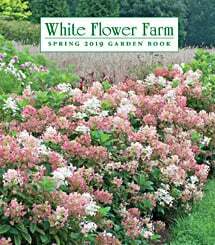 For our money, the best form is still the species N. alata (often called Jasmine Tobacco) which produces tall, graceful stems of pale, nodding flowers with starry faces. Its soft, sweet perfume peaks at dusk on warm nights, attracting exotic pollinators and domestic gardeners to its calming presence. Bloom starts in July and continues into fall in a protected spot. These 3–4′ plants stand up to rough weather without staking and are not fussy about soil. A half day of sun is plenty, which makes it easy to tuck them in near a door or window and enjoy their perfume indoors. Perennial in Zone 10. For more information on growing Nicotiana, click Growing Guide. The first batch of three Nicotianas arrived in pieces, so I contacted White Flower Farms and they recent three more, larger plants. The two plants that got full sun did really well and bloomed for months. The partial shade plant never bloomed. This nursery would never have sent me a plant like that in the past. I'm crossing my fingers but I will not be rushing to buy another. Bought several of these 2 years ago to include in my scented moon garden. Finally, I thought, I had found the true species, not the scentless hyrids sold at my local nurseries. They arrived healthy and in perfect condition. Within weeks they took off, simply gorgeous! My great disappointment came when I found them to be totally scentless, not even a hint of scent on the warmest of evenings. Can't understand it, as other buyers describe a heavenly scent! Tried the sylvestris and again, no scent! I have a keen sense of smell, so not sure what the problem is! Will try again this year, as the plants are truly lovely and so hardy! that it's white and has fragrance. What a wonderful choice that was. Every evening the scent filled my small backyard with a wonderful fragrance. plant several in a group. Flourished! A tropical genus that has Tobacco as its most widely known member, but all the 70-odd species are fragrant in flower or leaf, or both. Their pale, luminous flowers often open in the evening, so tuck plants in near a door or window to get their Jasmine-like perfume indoors. Give them full sun or partial shade, and grow in well-drained soil enriched with organic matter, such as compost or peat moss.